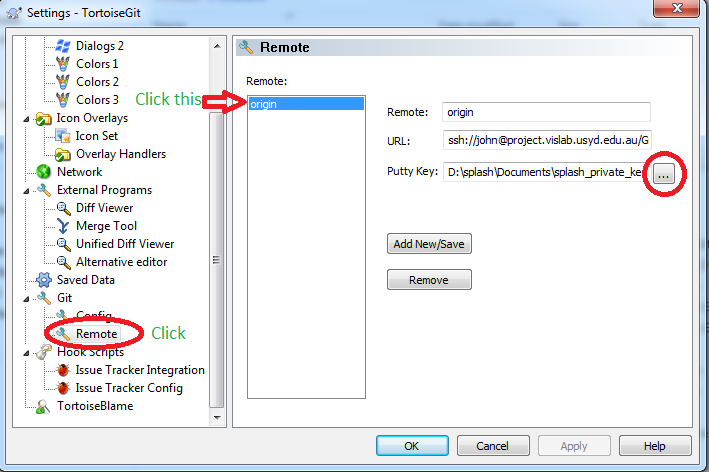 Right click on this folder, in the context menu for "TortoiseGit" goto "Settings"
Click on the remote configuration e.g. "origin"
Now you should be able to push and pull with this repos without a password prompt. If you cannot automatically login, you can check to see if putty auto login works by starting new session and providing the private key in the option Connection->SSH->"Private key file for authentication". If you are still prompted for password, then there is a problem with the key construction, or registration of keys with the ssh server (protocols, permissions etc).